Fix leaking taps as soon as possible. 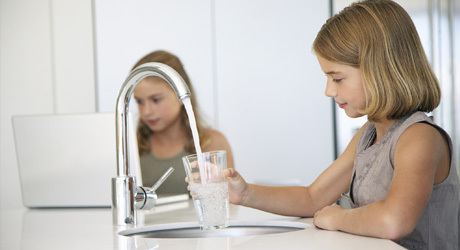 A dripping tap can waste more than 60 litres of water per week. In most cases, all that is required is a new washer. Replace worn tap washers, a quick and cheap way of saving water. 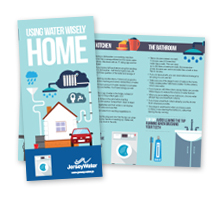 Make sure water pipes and external taps are lagged in time for the cold winter weather. Burst water pipes and leaks can cause serious damage as well as waste water. Insulate hot water pipes to reduce the amount of water that must be run to get hot water (this will save energy too). Use a bucket and sponge when washing your car. Rinse the shampoo off with a watering can instead of using a hose. Washing your car at the local automatic car wash saves you time and effort and they probably recycle the water they use too. When buying a dishwasher or a washing machine choose one that is energy efficient as this saves water and electricity. Machines with an ‘A’ rating sign are the most efficient. Wait until you have a full load before using the washing machine or dishwasher – half-load programmes still use around three quarters of the water and energy of a full load. Try hand washing woollen items, it does just as good a job as machine washing and saves several litres of water. Only boil the amount of water you need when cooking or making a hot drink.This will save water and reduce your energy bills and also be quicker. Keep a bottle or jug of water in the fridge, instead of leaving the tap running while it gets cool. Avoid rinsing dishes in the sink before loading them into the dishwasher. Scrape them clean instead. Don’t wash vegetables and fruit under a running tap. Fill a bowl with water and use that. Use the leftover water from washing vegetables to water plants. Always try to use the plug and don’t let the tap run when you’re washing your hands or washing up. Better still, use a washing up bowl in the sink. Take a shower instead of a bath. A shower uses 2-3 times less water than a bath. This can save up to 400 litres of water per week. But remember – power showers can use more water than a bath in less than 5 minutes. Take a shorter shower, 4 minutes or less. Showers can use anything between 6 and 45 litres per minute. If you do have a bath, you can save water and energy by ensuring it is not over full. Toilets are one of the largest users of water in the home. Toilets installed after 1993 have smaller 7.5 litre cisterns, which save water. If you have an old 9 litre cistern Jersey Water can provide Water Hippos to reduce the volume of water flushed, please contact Customer Services Department to find out more. When you are installing a new bathroom, choose water efficient taps and dual flush cisterns. If you have a dual flush cistern already, use the shorter flush whenever possible. Use plugs in washbasins when you have a wash, or are cleaning the bathroom, rather than leaving the tap running. Turn off the tap when brushing your teeth. A running tap can use 6 litres of water per minute, so turn off the tap whle you keep that smile sparking !